NOTE: You are purchasing a standalone product. MasteringA&P does not come packaged with this content. If you would like to purchase both the physical text and MasteringA&P search for ISBN-10: 0133873218 /ISBN-13: 9780133873214 . That package includes ISBN-10: 0133902382 /ISBN-13: 9780133902389 and ISBN-10: 0133999300 /ISBN-13: 9780133999303. For the two-semester A&P laboratory course. All instructor resources for this title are available in the Instructor Resources section on the MasteringA&P site. Helping millions of future healthcare professionals prepare for lab and practice lab concepts. Revered for its thorough, clearly written exercises and explanations, Human Anatomy & Physiology Laboratory Manual has provided millions of future healthcare professionals with a complete hands-on laboratory and learning experience. The fully revised Eleventh Edition provides a more active, workbook-style approach that incorporates visual summaries, streamlines information, and engages students with hands-on drawing and review activities. New features include assignable Pre-lab Videos that introduce students to the lab and related equipment, and “Why this Matters,” which shows the relevance of lab activities to real-life and clinical examples. This edition is fully integrated with MasteringA&P, offering assignable visual media and activities that promote active learning and engage students. 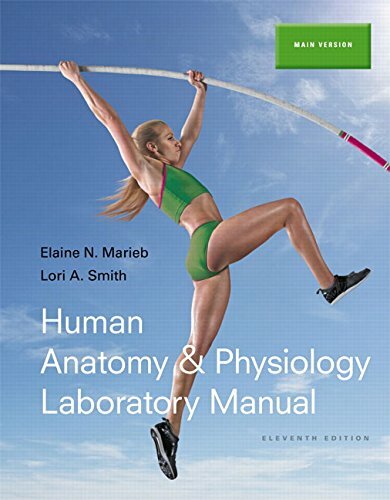 For the first time, the lab manual is publishing alongside Marieb/Hoehn’s best-selling Human Anatomy & Physiology . Designed to meet the needs of the 2-semester A&P laboratory course, the manual can be used with any A&P textbook and is available in a customized edition, as well as in three conventional versions: Main (Eleventh Edition), Cat (Twelfth Edition), and Fetal Pig (Twelfth Edition). Also Available with MasteringA&P ® This title is also available with MasteringA&P – an online homework, tutorial, and assessment program designed to work with this text toengage students and improve results. Within its structured environment, students practice what they learn, test their understanding, andpursue a personalized study plan that helps them better absorb course material and understand difficult concepts. Students, if interested in purchasing this title with MasteringA&P, ask your instructor for the correct package ISBN and Course ID. Instructors, contact your Pearson representative for more information.